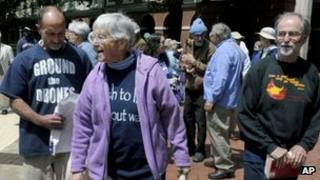 Image caption Sister Megan (centre) said the site made "that which can only cause death"
An elderly Catholic nun and two peace activists have been convicted for damage they caused while breaking into a US nuclear defence site. Sister Megan Rice, 83, Michael Walli, 64, and Greg Boertje-Obed, 56, admitted cutting fences and entering the Y-12 site in Oak Ridge, Tennessee, which processes and stores uranium. The incident last July prompted security changes. Sister Megan said she only regretted having waited 70 years to take action. A jury deliberated for two and a half hours before reaching its verdict. The three face up to 20 years in prison after their conviction for sabotaging the plant, which was first constructed during the Manhattan Project that developed the first nuclear bomb. The three, who belong to the group Transform Now Plowshares, were also found guilty of causing more than $1,000 (£643) of damage to government property, for which they could face up to 10 years in prison. Walli and Boertje-Obed, a house painter, testified in their own defence, telling jurors they had no remorse for their actions. Sister Megan stood and smiled as the verdict was read out at a court in Knoxville, Tennessee. Supporters in the courtroom gasped and wept and sang a hymn as the judge left. The break-in disrupted operations at Oak Ridge and reportedly caused more than $8,500 of damage. "We are a nation of laws," prosecutor Jeffrey Theodore said during closing arguments. "You can't take the law into your own hands and force your views on other people." But defence lawyers said the break-in was symbolic and was not intended to hurt the facility, and officials have acknowledged the protesters never got near nuclear material. "The shortcomings in security at one of the most dangerous places on the planet have embarrassed a lot of people," said lawyer Francis Lloyd. "You're looking at three scapegoats behind me." Sister Megan said her only regret was waiting so long to stage her protest. "It is manufacturing that which can only cause death," she said. In a statement to the court, Boertje-Obed said: "Nuclear weapons do not provide security. Our actions were providing real security and exposing false security." The three activists admitted cutting the fence to get into the site, walking around, spray-painting words, stringing out crime scene tape and chipping a wall with hammers. They spent two hours inside. After the activists' action, Congress and the energy department investigated the facility and found "troubling displays of ineptitude" there. Top officials were reassigned, including at the National Nuclear Security Administration. WSI, the company providing security at the site, was dismissed and other officers were sacked, demoted or suspended.